Have finally got back to the blog, fortunately no major dramas to account for the silence, just busy with life, work and having more fun weaving rather than writing about it. 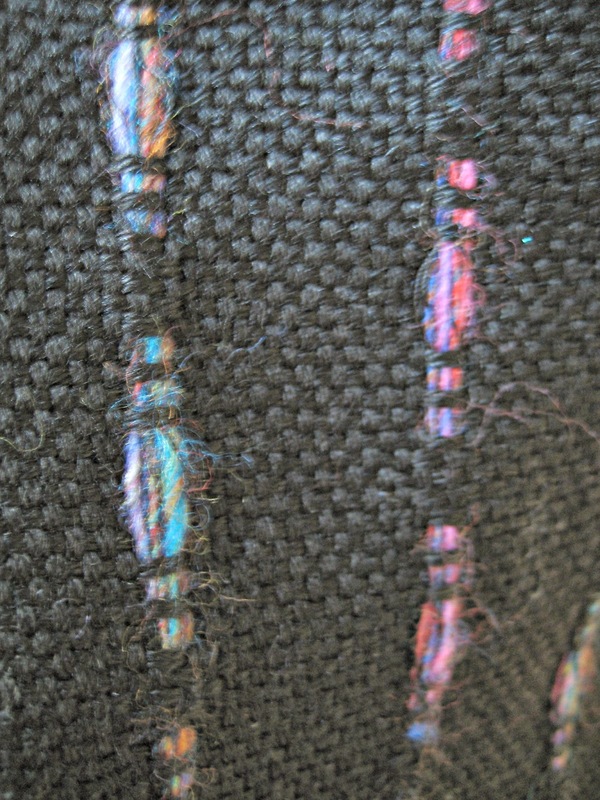 I mainly weave with fine wools and 8/2 unmercerised cotton. 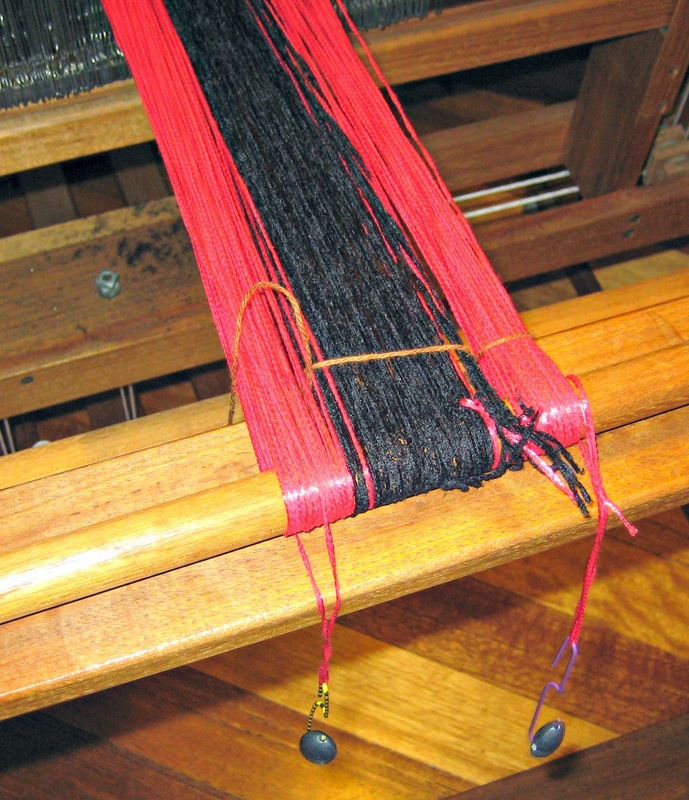 These are not particularly slippery yarns and I have not had any trouble winding even long warps up to 15 metres on my warping mill, so tend not to use choke ties. Last time I was at the local yarn shop I spied a cone of a fine Italian rayon ribbon knitting yarn. Although I didn’t have a firm plan for it, the colour – somewhere between red and coral with a great rayon shine – spoke to me and of course it followed me home. 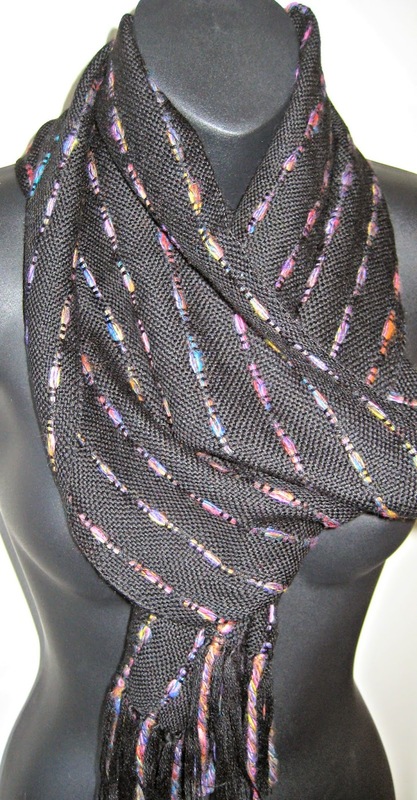 I used some in some black scarves with a supplementary warp. 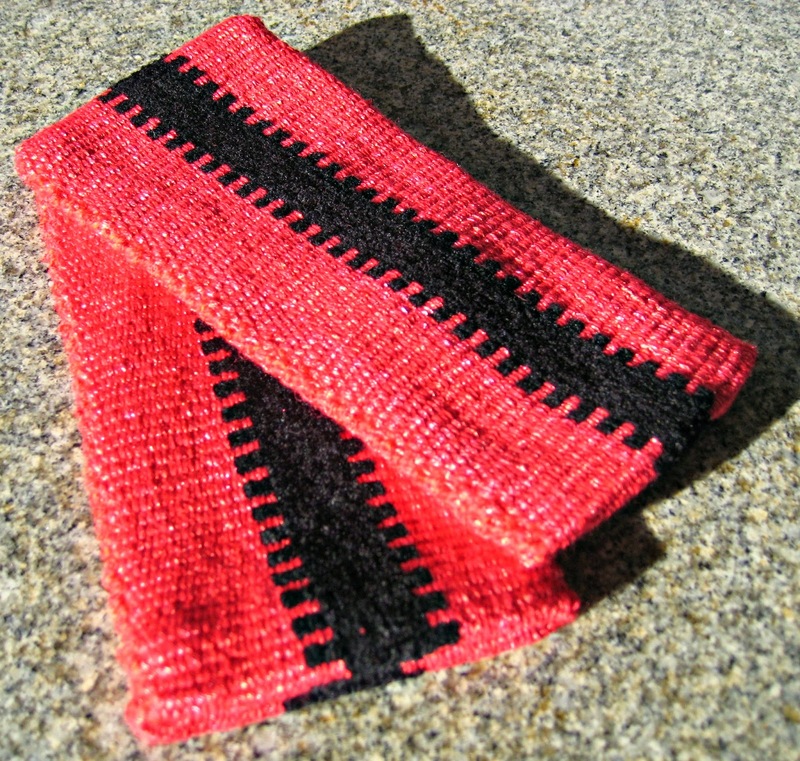 The red was the first and looks great but I didn’t really think the project through and the red accent yarns were not secured well enough and if caught behave like threads for smocking or woven shibori. I guess that’s one for my scarf collection but for the next 2 I used less slippery handspun yarns, and secured them much better. About this time I realised my stock of glasses cases was getting low so decided to use the rest of the red yarn to top up the stock. 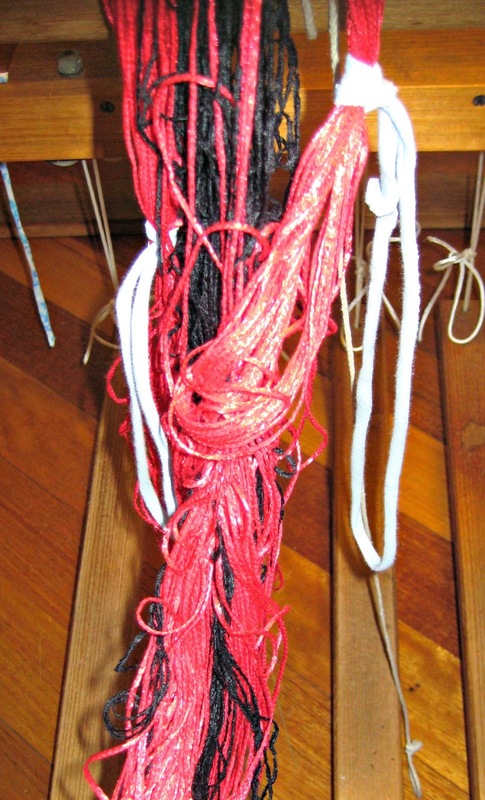 I thought that the shiny red rayon would contrast well in colour and texture with some black chenille in the stash and I started to wind the warp. 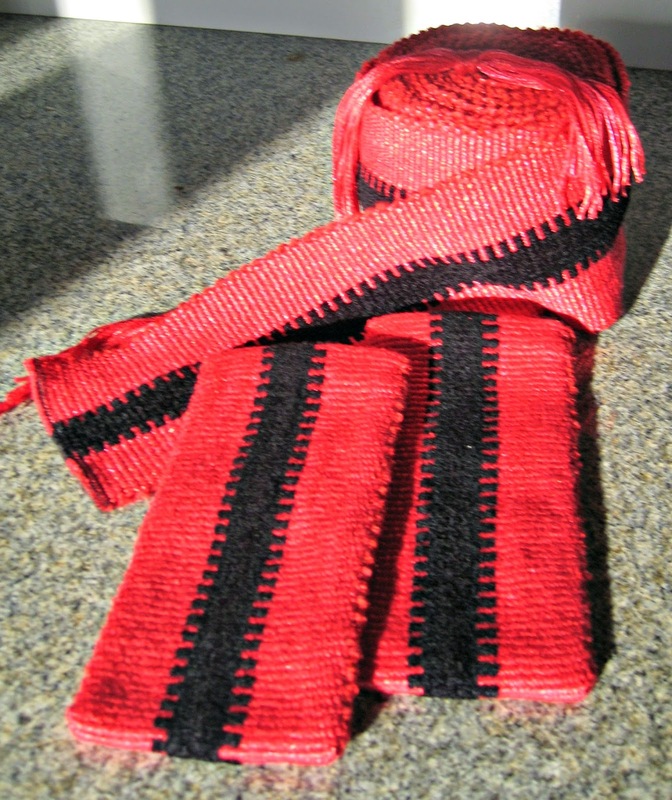 The rayon yarn was much heavier than the yarns I normally use and very slippery but I didn’t think about choke ties. As I started to take it off the warping mill it mostly fell down under its own weight and was not helped by getting the guide string mixed in with it. It was one of those ‘it’s just yarn’ moments but I knew that there had only been one cone at the yarn shop so I persevered. In the end I wound it on to the warp beam, then on to the front beam and back on to the back beam, working out the mess as I went. 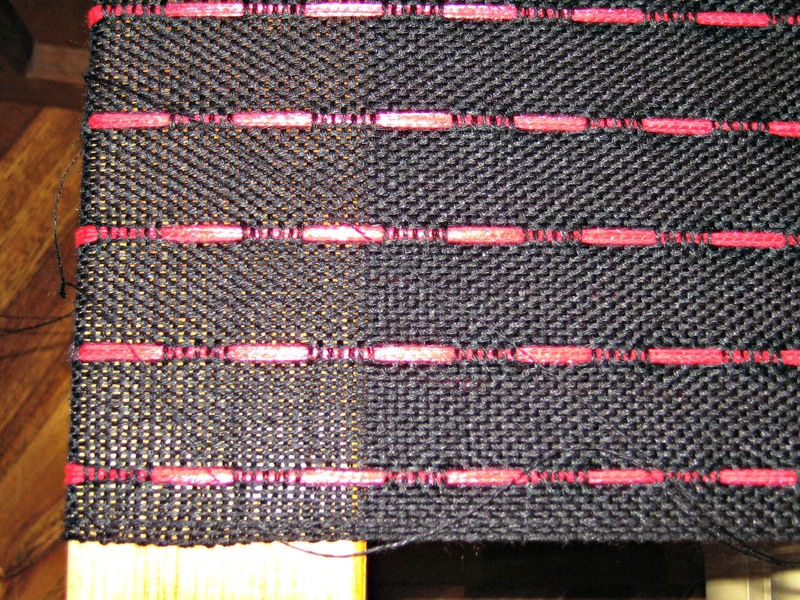 I eventually (after working on it for a whole day) managed to get it on with reasonable tension as this picture of the very end of the warp shows. The end result was just what I had planned so I was glad I didn’t give in to the ‘it’s just yarn’ moment but know that I really do need to use choke ties for any yarns like the red rayon. Been wondering about you! Had a "its only yarn" moment myself this week. Still wonder why I don't just bin the mistakes and start afresh.